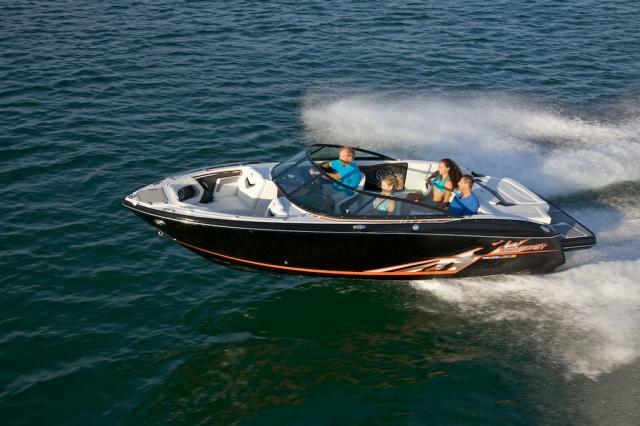 The 2017 Monterey M-65 capitalizes on the trend in runabouts toward outboard power. If you look at the current runabout market, there’s a lot going on. 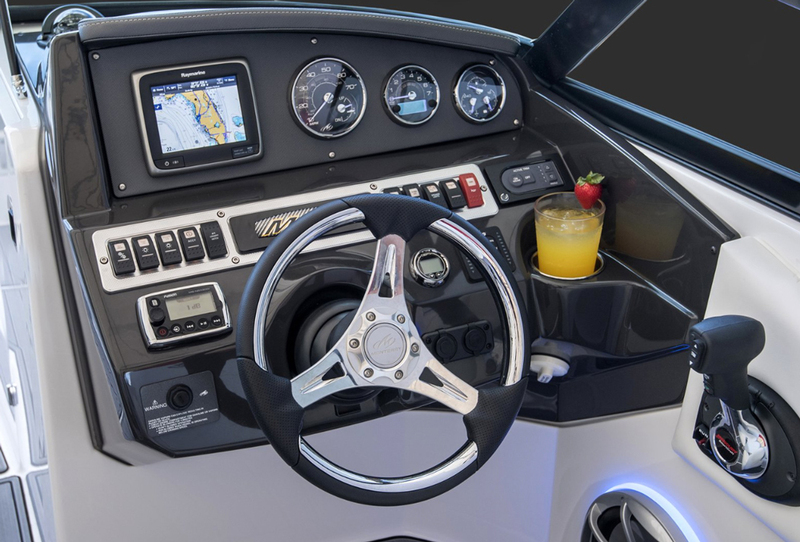 New trends are everywhere in terms of design, materials, engineering and application, and as seen with the new Monterey M-65, a shift towards runabouts with outboard power. Gone are the days when outboards wreaked of raw fuel, emitted clouds of smoke and grossly polluted the environment boaters sought to enjoy. Now, outboards are refined, quiet, and clean. 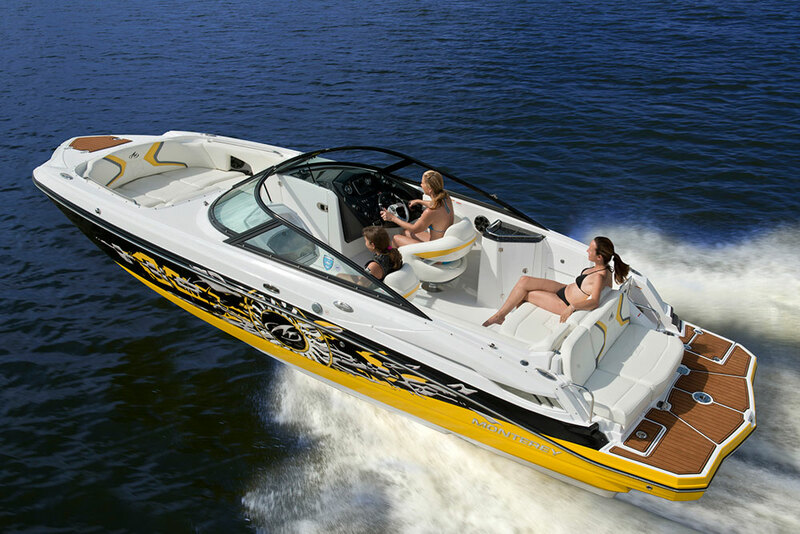 Not only that, but they also allow for a lot of creative freedom when designing a boat. Quite literally, the entire footprint of the boat is in play and can be devoted to accommodating people rather than engines. 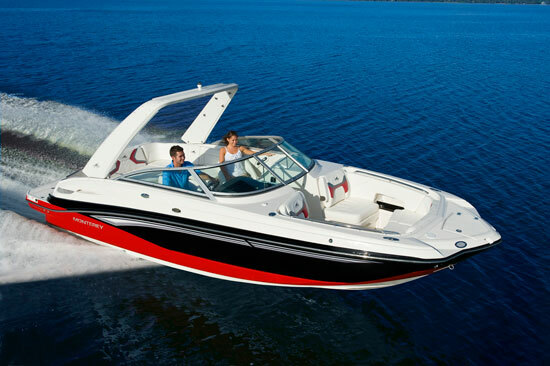 We noticed this years ago, when we first examined whether outboard engines and bowriders were a match made in heaven. 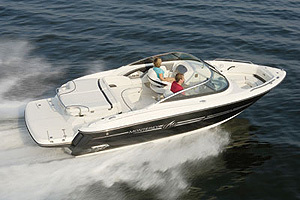 The Monterey M-65 comes with a 300-horsepower Mercury Verado or Yamaha outboard. 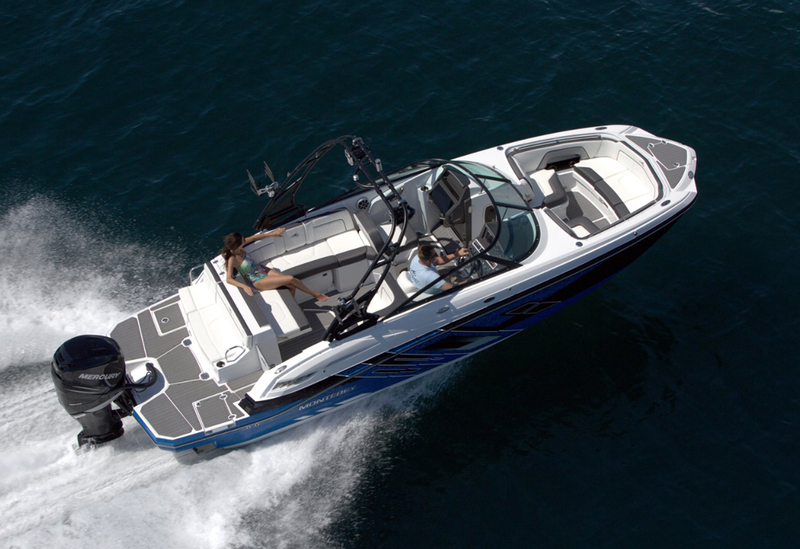 The biggest issue with putting an outboard on a bowrider is generally the loss of swim platform acreage, but the new M-65 comes with a swim platform as large, if not larger than that of any sterndrive runabout. There is no compromise in platform space with the M-65. The platform is generous, with SeaDek foam padding (we love this stuff—check out All Decked Out to learn more about SeaDek), a three-quarter-width rear-facing bench, cupholders, a locker and a ladder offset to the starboard side. There are also grab rails to assist when boarding. Inside, the cockpit flooring also is covered in SeaDek—although flooring padding is optional—with a number of handy features that let people use the boat for whatever application they choose. For instance, the rear bench is convertible, meaning it flips up to become part of the rear bulkhead. When you need more seating, flip it down. When you need more deck space, flip it up and out of the way. It’s simple and handy. There’s also a jump seat on the starboard side behind the helm. To port, the passenger’s seat backrest pivots to face forward or aft, but that’s optional. Also on the port side, the center backrest cushion flips down to reveal an armrest with a pair of cupholders. It seems like such a simple idea, but I don’t recall seeing it on many runabouts. At the helm, the driver’s seat features a flip-up thigh bolster for steering with better visibility. The helm is a rewarding place to be. It’s laid out simply, with a tilt column, a stereo control head and depthfinder, a row of switchgear, then the vital analog gauges and space for an optional GPS chartplotter. Up front, the bow area is smartly designed. Why? Well, it’s versatile because you can use it traditionally, as a place for two forward-facing passengers to lounge, or as an additional “cockpit” with seating for five, three of which face the stern. The optional $385 bow filler cushions are a good addition, but the removable dinette table comes standard. It also mounts in the seat base instead of the deck so there’s less danger of stepping in the receptacle when the table isn’t in place. There’s also a place to mount the table in the rear cockpit. True to its suitability to many applications, the M-65 can be configured in a number of ways. First, it’s a big runabout with all the room of a deck boat. Second, its options list lets users gear it toward multiple uses. A wakeboard tower is available for $6,000, and that includes a Bimini top. There’s also an optional propane grill for entertaining at meal times, and optional rod holders if fishing is your thing. The M-65 should have wide appeal, and to a variety of buyers. (Base MSRP for the Monterey M-65 is $66,731). 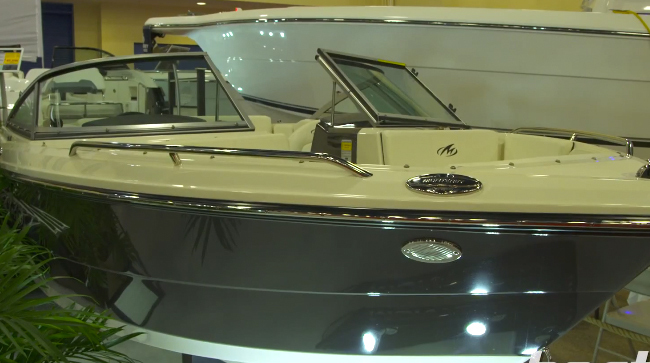 It’s versatile and functional and shows a lot of thought went into how people will actually use this boat. That might be its biggest selling point, so let’s hope that’s another trend that takes hold. 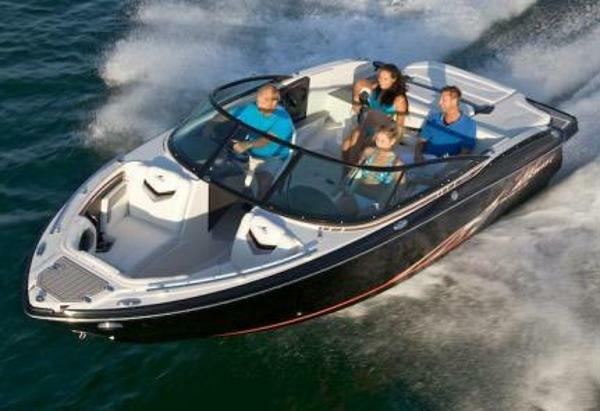 Other Choices: Some other outboard powered runabouts in this size range that have hit the market recently include the Chaparral SunCoast 250 and the Sea Ray 240 Sundeck. A more traditional stern-drive pick might be the Four Winns Horizon H260. For more information, visit Monterey.